Mesplé visits his roots in foundry work with these unique sculptures. Recalling his interest in archaeology, the sculptures are anatomically correct and are produced in his advanced lost-wax technique. His methodology supersedes his years, and is reflected in the immaculate works brought to life by his expert hand through intense and often ironic imagery. Molded directly from its leather form, this hollow bronze jacket is nickel plated and studded with hand-sculpted glass to capture the iconic culture and attitude of punk rock. Hundreds of hours went into the creation of this life-size skeleton made of bronze and steel. The work dives deep into the conundrums of human culture. Titled in Latin after the first word ever recorded to mean pathological liar, 'Pseudologia Fantastica' offers a flash of the truth and insight to a darker mind. The smirking figure will forever be addicted to the evil joys of his tangling idiocies placing himself powerfully at the center of trust and betrayal. Definitively portraying the popular symbol for the beloved city, Mesplé captures the absolute culture of Los Angeles in this limited edition sculpture produced in a new finish each year including ferric silver nitrate, black chrome and gold. Shamed in its concrete wall mount, Imposed begs hopelessly to be freed. Frozen in an exotic twist between the afterlife and everlasting struggle, Dominion is one of Mesplé's early creations of 2015. Cast in bronze, bone by bone, the artist emulates an etherial creature taking over the human form. 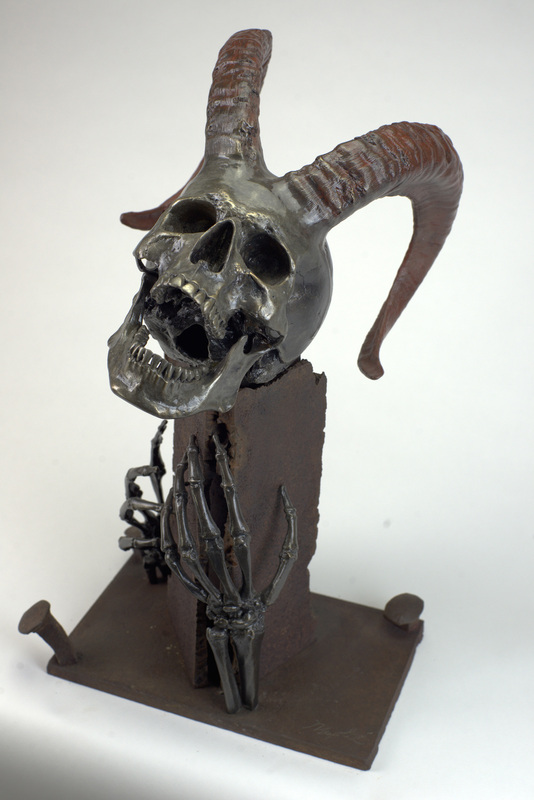 21" x 12" x 12"
Mesplé's adoration for the ironic classification of subcultures is exploited in Larker, cast in bronze and welded together as a wall installation.